Is Your "Food Personality" Secretly Sabotaging Your Fat Loss? Which of these "food personalities" describes you? Find out why your fitness goals have stalled, and what to do about it! There's more to healthy eating and sustainable weight loss than just knowing the basics. If you're not seeing the results you want—or expect—in spite of working out regularly, it's possible that your "food personality" is holding you back. These personalities describe how you act and who you become when you expose yourself to certain foods. Without keeping them in check, these behaviors can separate a remarkable body from a mediocre one. Here are the six common food personalities you'll come across, and how to deal with them along your own fitness journey. This person lives by the motto, "Work hard, play hard." 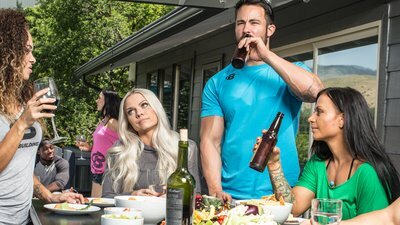 When it comes to fitness and diet during the week, the Casual Easy-Goer is as straight as an arrow. Their work ethic at the gym is unwavering, and their clean diet goes off without a hitch. Then the weekend and special events arrive, and it's as if Superman has just been hit with Kryptonite. As they close the books on their Monday-Friday schedule, they also say farewell to their dietary compliance. For the Casual Easy-Goer, having a good time with food and drink is priority number one. Saying "no" is impossible because they have serious FOMO (fear of missing out) issues and always say "yes" out of guilt, obligation, or societal rituals. At football tailgates, they drink beer in liberal amounts and eat plenty of wings, hot dogs, and burgers. They can't turn down two-for-one margarita specials or half-off Merlot during happy hour. After all, life is meant to be enjoyed, right? Hang out with your friends and go to your favorite events, but limit your consumption of spirits and party snacks. The fix: Pay attention to your environment and ask yourself, "Am I indulging out of true hunger, or eating and drinking out of obligation, expected societal norms, and peer pressure?" Social events can be just as fun without getting trashed or stuffing yourself with garbage foods. Moderation is more important than anything to the Casual Easy-Goer. Hang out with your friends and go to your favorite events, but limit your consumption of spirits and party snacks. Just remember that clocking out for the workweek doesn't equate to punching the timesheet for your fitness habits as well. Five days of eating diligently and training like a Spartan warrior can't compensate for inhaling everything in sight for 48 hours straight. This personality's motto is, "I see food, I eat food." As the name implies, this person possesses a raging appetite. Unfortunately, he or she also has a lack of self-discipline, reflected in portion sizes that can boggle the mind. This person might train like an animal, but working out is often seen as an excuse to overindulge and eat more junk food. This person might train like an animal, but working out is often seen as an excuse to overindulge and eat more junk food. The fix: The insatiable eater needs to take a lesson from the Okinawans and practice the hara hachi bu philosophy, which roughly translates to, "Eat until 80 percent full." Practice the skill of food awareness by keeping a journal or logging your food on a nutrition app. This will help you analyze what and how much you've been eating. Practice taking time between each bite to actually enjoy and savor the particular flavors of your food. Patience during your meal is valuable because your brain doesn't immediately register that your stomach is full, which can easily lead to overeating. Instead of eating substantial portions and risking too many calories in one sitting, this person simply eats in short bursts all day long: a handful of nuts here, a piece or two of candy there—and hey, who can say no to homemade cookies? The professional grazer eats out of boredom, curiosity, nervousness, or just because food is within reach. This person doesn't reach their fitness goals because they fail to acknowledge that all calories count, no matter the portions or sizes. Often, they overeat without even realizing it. They're frustrated when their goals aren't met because, after all, their portion sizes are so small! Never mind that they're noshing 12 times a day! To wean yourself off this behavior, track your food intake for a couple of days to develop some awareness about your eating behaviors. The fix: Priority number one for this personality type is to realize that all calories count, in all portions and amounts. Period. A few other things to practice: Eat fewer meals (including snacks) and opt for bigger, more satiating meals. Double-check your fiber intake, as this nutrient slows down digestion and promotes fullness! Fiber-rich foods include whole grains, fruits, and vegetables. Ask yourself, "Why am I snacking? Is this behavior due to my nerves, anxiety, or boredom? Or is this a coping mechanism?" Lastly, consider your hydration status. If you're slacking with your water intake, chances are you're feeling hungry because you're dehydrated—not because you're truly hungry. Whatever the case, it's time to eat. At least it is for this food personality. These stressful disruptions to the Emotional Eater's day are alleviated by food—oftentimes, in the form of fat-soaked foods and sugar-laden drinks, to boot. While the Emotional Eater is consistent with workouts, their results don't seem to match up with how hard they're training. Emotional Eaters let emotions lead them down a path of binging and caving into societal pressures—only to feel guilty about these actions after the fact. It's essential to seek a healthier alternative to eating as your stress-relieving outlet. The fix: The most powerful tool for the Emotional Eater is awareness. Just because one area of life seems out of control doesn't mean you need to let that seep into all other facets. Before binging, ask yourself "why" three times before making a decision. Most of the time, you will realize it's not hunger—it's boredom and a need to escape uncomfortable, stressful situations while seeking short-lived pleasure. Seven days a week, this person is dining at various restaurants. This person lacks culinary skills. Often, he or she isn't interested in learning, either. They may use the excuse of being "too busy" to cook and prepare their meals. So they rely on takeout and restaurants for their nutritional needs. Hey, we all like to indulge in restaurant fare every now and then, but constantly eating out is a dangerous game. The 24/7 Diner isn't able to control the portions given at restaurants. They simply can't know what oils and ingredients are being used in their food. They're at the mercy of "hidden macro syndrome". Sure, it looks like plain chicken breast and rice, but perhaps the chicken was prepared in liberal splashes of oil, and the rice cooked in butter and other ingredients not normally used in home cooking. So, what was originally thought to be around 500-600 calories might clock in at 1,000 or more. Sure, it looks like plain chicken breast and rice, but perhaps the chicken was prepared in liberal splashes of oil, and the rice cooked in butter and other ingredients not normally used in home cooking. The fix: You don't have to be a top chef or conjure up world-class meals, but you should be able to prepare a few basic go-to dishes that get you through the workweek. Look for steam-bag veggies and precooked grains that already include a flavoring of some sort to cut down on your cook time! By eating at home, you know exactly what foods are going into your body and can avoid playing the macro-guessing game. For the busy folks, practice uniform eating—eating the same 2-3 meals during the week—to simplify the meal-planning process. It's why so many health experts recommend cooking foods in bulk once or twice a week to eliminate guesswork throughout the week. An example of uniform eating is the rice-bowl strategy: Each bowl contains a serving or two of your meat of choice, a serving or two of rice, and veggies. While working, writing, driving, or watching Netflix, this person is mindlessly eating because their attention is elsewhere. Popcorn, candy and a movie, anyone? The multitasker is diligent with workouts, but hardly sees the results because they tend not to be mindful of what they're eating. To them, convenience trumps nutritional composition. Popcorn, candy and a movie, anyone? The fix: Stop multitasking. Seriously. While claiming to be a multitasker seems cool, it's likely only about 2 percent of people are multitaskers, so you're probably not one of them. Invest in a calendar to help you organize your schedule. Schedule blocks within the day that allow you to focus solely on eating your meals—not eating on the run, during a conference call, or while you're surfing the web. Actually sit down and give yourself absolute focus on only that specific activity. Doing one activity at a time prevents you from mindlessly eating hidden calories. Plus, you might become more productive and efficient due to giving your undivided attention to every activity. So, now that we've gone over the six food personalities, tell me: Which of these six personalities are currently causing you the most problems with your fitness? And what do you plan to do about it? Comment below, and I'll be sure to hit you back with a response. Julian Hayes II is a writer and fitness coach at The Art of Fitness & Life where he helps remarkable individuals level up their fitness.